This past week, after the girls got over their "bug" and Patrick found out he would have Friday & Monday off work for the holiday weekend...we made a last minute decision to take our 1st family vacation to Colorado. My dad & stepmom (Grandpa Todd & Grandma Julie) have been in the process of moving out there since the beginning of May from New Mexico. And since no time is better than the present, and Pat doesn't get paid for when he has days off - we decided to just pack up and go for a weekend visit! If any of you know us real well, this was a very BIG step for us. Usually we plan for weeks out, and are very detailed on when, what, who and where...but this time we planned in a little under two days, to venture cross country to see Gma & Gpa Sowerby. So we packed up clothes for all four of us, extra clothes, toys, books, movies, snacks, drinks, pillows, blankets, cameras, phones, chargers, baby bed, and everything but the kitchen sink...found a wonderful dog/fish sitter - my mom. Thank you so much! And we left Thursday night, after dinner and bath time. Perfect time for falling asleep all night, right? Well, the girls did fall asleep soon after we left for about 2 hours. 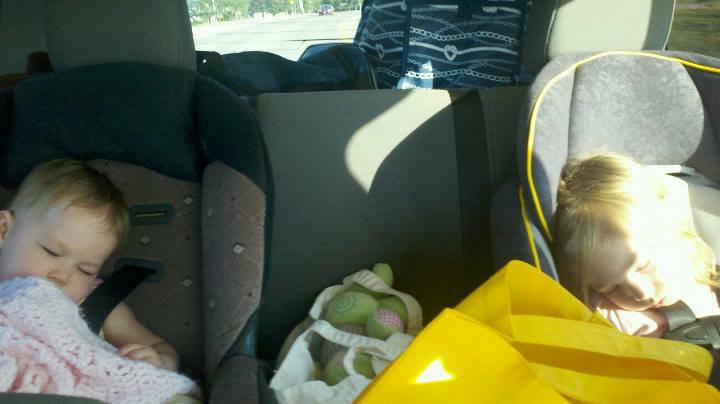 Then after a short stop, they both woke up and stayed awake for about three or four hours each. Eventually, Arwen fell asleep and we had to make Destin fall asleep by turning off her movie player. Friday (Day One) ~ We arrived in Colorado in 9 hours, at about 3:00 AM...we slept for a few hours, then the next day we mostly just hung our with Grandma and Grandpa. The view of the mountains from their upper deck. We got to meet & feed the neighbors horses, Reba & Blondie.We went to Lowe's - where we bought some flowers to plant (many on clearance! ), saw the mountains (driving by), checked out their huge farm house/barn/land, played in the pool, met the neighbors horses, played with the dogs, and enjoyed each other's company. I love this pic of Arwen smiling! I LOVE this pic of Grandma Julie & Destin! We took sooo many amazing pictures...so I am only sharing my favorites..stay tuned for Day 2 - our trip to Garden of the Gods.